If you’re lucky enough to live near a stand of pine and spruce trees, you may be able to trim enough branches to make this DIY beautiful pine centerpiece for almost no cost. Fresh boughs can also be found where Christmas trees are sold, or at craft stores and garden centers. You’ll also need pine cones, a candle, and other natural embellishments. This is a messy job, but so pretty when it’s all done and the mess is cleaned up. You can see some of the mess that I made in the assembly photo at right, showing some of materials collected to make the centerpiece. Glue the floral foam to the center of your dish. I used a regular glass soup bowl about 11 inches wide. Allow the glue to dry completely. Place your candle holder in the centre of your foam as shown here and add enough water to completely saturate the floral foam. Begin inserting pieces of pine as shown at right, beginning at the outside edge of the foam and working your way toward the center until you reach about one inch from the outside of your candle ring. With the empty space surrounding your candle holder, insert small pieces of spruce staying far enough away from the candle holder (about a quarter inch) so that you can easily lift your candle holder out of the piece and re-insert it. 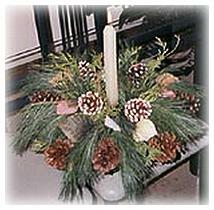 Add any springs of pine or spruce throughout the arrangement to cover any hollow areas. To add pine cones to your arrangement, simply wrap floral wire around the bottom of your cone, and twisting the wire to secure it to the cone. Leave enough excess wire so that you can insert the wire into the foam. ne cones used in each arrangement has white snow added to the edges of the cones. To do this, simply paint on a little faux snow (white paint works too) along the edges of the pine cones. Add a few Christmas or Berry Picks or simply add a few artificial floral leaves. Place your candle in the holder and you’re all done. These arrangements cost very little to make and make wonderful gifts.